The birthday party theme will weave itself through the party and tie it together. The theme can be brought out in the invitations, decorations, games, activities, favors and goody bag. When selecting a birthday party theme first ask what your child would like - do they have a favorite character, sport, interest or dream that would make a fun birthday party theme? We've compiled all of our favorite do it yourself theme party ideas for kids, tweens and teens ages 1, 2, 3, 4, 5, 6, 7, 8, 9, 10, 11, 12, 13, 14, 15, 16, 17 years old. 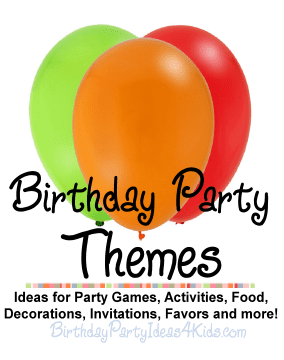 Each birthday party theme is complete with free, budget friendly, cool birthday party ideas for boys and girls, invitations, decorations, games, activities, food, favors and goody bags. Over 200 of the best party theme ideas including funny themes, cool party themes, unique birthday party themes for girls and boys, kids, preteens and party themes for teenagers. Find birthday party supplies for all our fun themes! Use these fun and unique birthday theme ideas to get the party started! We are adding new birthday party themes each week! What are your favorite unique themed birthday ideas? Send in unique and cool themes, funny themes, house party themes, kids party themes for boys and girls and we will add them to the best party themes and birthday party ideas website! Choose a party theme that expresses your child's personality or interests. Break the rules (there really are no birthday party rules!) and make a fun party by combining themes! The main idea is to just have fun! Use the games and activities on each of the birthday theme pages to keep kids busy and interacting with the other party guests. All of our games are inexpensive and easy to put together using everyday items from around the house. Always have an extra game or two on hand just in case the guests speed through the games and activities. It's always a good idea to be prepared! A birthday party doesn't need to be expensive to be fun! Shop for birthday party supplies online or at the dollar store. Solid color table cloths, cups and plates are great when combined with items from your chosen theme. Party favors, goody bags and decorations can all be found at the dollar store and combined into a great party treat for all ages!